I am the only person in my household who likes rye bread, but that didn't stop me from making this light rye sandwich loaf today. Tonya even had a taste and gave her approval. 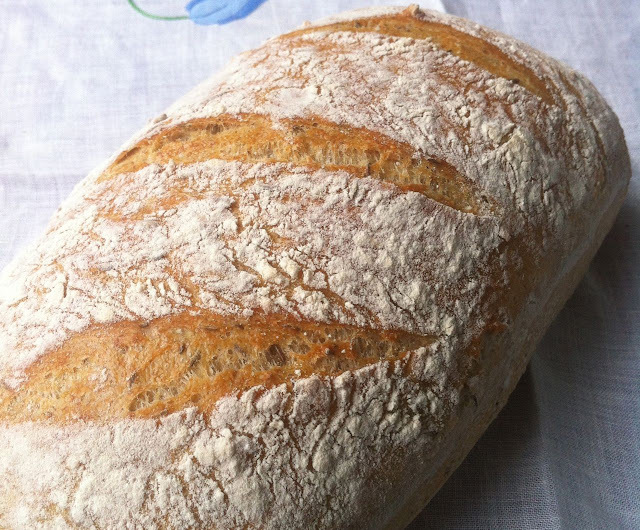 Again I used a modified version of Jim Lahey's No Knead Bread. This time I just held back a few tablespoons of water to make the dough a bit more manageable, subbed in about 1/3 cup of rye flour, added a handful of caraway seeds, and baked it in a bread tin instead of a cast iron pot. This made awesome breakfast toast with an over-easy egg on top. Makes me feel like I'm back in NYC. Hello, this weekend is nice designed for me, as this moment i am reading this enormous informative post here at my house.